Glaucoma is a disease that damages the eye’s optic nerve. It usually happens when fluid builds up in the front part of the eye. That extra fluid increases eye pressure, damaging the optic nerve. It also can result in partial to complete loss of vision. Glaucoma is one of the leading causes of blindness in the United States. It can occur at any age but is more common in older adults. The two most common types of glaucoma are primary open-angle and angle-closure glaucoma. Most people with this disease have no early warning signs, and often no pain. Doctors recommend that people over the age of 40 who have a family history of the disease should get a complete eye exam every one to two years. Those with health problems, such as diabetes, or a family history of glaucoma may need to go more often. Primary open-angle glaucoma happens gradually. The symptoms are slow and may go unnoticed, but can include patchy blind spots in peripheral or central vision, and tunnel vision in the advanced stages of the disease. The eye does not drain fluid as well as it should and therefore eye pressure builds and starts to damage the optic nerve. This type of glaucoma is painless and may not cause vision changes at first. Angle-closure glaucoma occurs when the iris is very close to the drainage angle in the eye. The iris can end up blocking the drainage angle, and when it gets completely blocked, eye pressure rises very quickly. This is called an acute attack. It is a true eye emergency that can cause blindness, and you should call your ophthalmologist right away. The damage caused by glaucoma can’t be reversed. But treatment and regular checkups can help slow or prevent vision loss, especially if the disease is caught in its early stages. Glaucoma treatment starts with lowering the pressure in the eye (intraocular pressure). 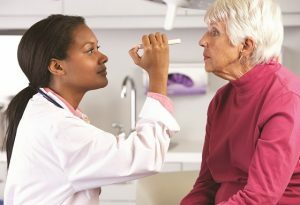 Depending on an individual’s situation, glaucoma treatment options may include eye drops, pills, laser surgery, traditional surgery or a combination of these methods. Exercise: Moderate exercise will benefit overall health. Exercising three or more times each week can reduce elevated intraocular pressure. Eye Protection: Wearing protective eyewear is important when you are outdoors or doing activities that could injure your eye. Eye injuries can result in traumatic glaucoma or secondary glaucoma. If you are a family caregiver and need assistance with your aging senior, such as getting them to and from their eye doctor appointments, we can help. FirstLight offers a number of Senior Care Services to support you.